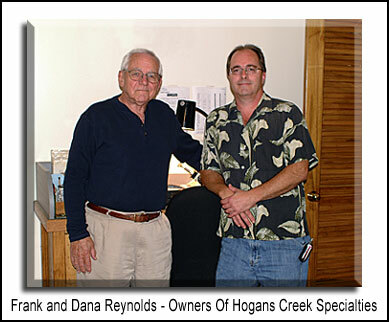 In our early years, Mastercutgems was known as Hogan's Creek Specialties Inc. to the wholesale gem and jewelry trade. Now as an exclusive E-commerce business, www.mastercutgems.com offers our gemstones to the public at the same low prices that most jewelers purchase for their own stores at wholesale. This business is owned and operated by Dana Reynolds and his wife Rachelle. We keep the over-head small so prices stay as low as possible. Dana searches diligently daily for deals in facet gem rough and / or gems to recut. This way, Dana finds the best stones at the best prices for our on-line clients. We do not offer services to walk in customers as our business is dedicated to internet clients only. This adds additional savings to our customers as they are not having to pay for an upscale store front shopping experience. MCG allows you to shop with us in the comfort of your own home or on the go through your Mobil phone or tablet. Dana Reynolds, president is a Certified Supreme Master Gem Cutter #96CGE42 through the American Society of Gem Cutters. Dana has been cutting and collecting fine gem rough for over 17 years. Dana bought his facet rough from all over the globe and back then I (Frank, his father) wondered why we were getting 600-dollar phone bills from Africa??? But little did I know he was investing in the future by purchasing natural, fine color-change sapphires from Tunduru, Tourmalines from Namibia, and all these different gem minerals from countries I had never heard of. Dana takes this gemstone business very serious, as he wanted the rare colors, and unusual gemstones not many people ever hear of; but he was a cutter and collector. So testing of the gem minerals as well as knowing where the gem mineral originated are all important factors in knowing what you have. We have all the modern testing equipment such as digital spectroscope, Refractive Index tester, dichroscopes, dark field 60x microscopes, color filters, and many other testing instruments to assure that you are getting what you pay for. Many of our gemstones were cut from our rough purchased more than 15 years ago; before many of the controversial treatments that we see today in colored gems. 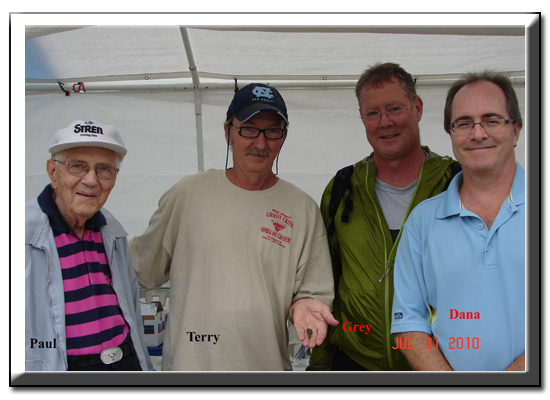 Paul Burton, Terry Ledford that operates the Hiddenite mine, then Grey Weaver, and myself. All our stones are tested, and our policy is, please take any stone you get from us to get it appraised, send it to AGTA, GIA or any known independent testing laboratory; and if it is not what we stated it is; we will gladly return your money plus the shipping you paid. No restocking fee etc… We know colored gems and stand behind everything we sell as genuine. We do not deal in synthetics, or diffused gemstones. Most of our gems are American cut gems from our rough; or re-cut from poorly cut native stones, as many countries do not allow un-cut gems out of their borders. It is easy to tell a native cut gem from an American/Modern cut gem; there is just more life to the gem. All the known information we have about an individual stone will be disclosed. We have built a reputation over the years of wholesaling as being honest, fair, and we strive to get you the best gemstone for the lowest price without sacrificing quality. We believe that any gemstone purchase is an investment and as anyone in the business knows; all gemstones are not created equal and prices should reflect that quality. This about us page could go on for many pages but I feel that trying us will be the best way to show you we do know gemstones, and we do have good business ethics. We have worked very hard to make sure you are happy with your purchases, and gemstones you purchase from us if taken care of should last you a lifetime and are gems that are worthy to be handed down to the next generation. Please feel free to contact about anything related to gemstones as we have over 3,000 natural gemstones in stock and several kilos of fine facet rough; way too many to list on the Internet. Gemstone questions are welcome, as we want you the consumer to know what you are buying. Being an educated buyer makes you a confident buyer and that is always the best and most comfortable way to shop. Thank you for your time and I am confident that you will be very pleased with any purchase you make with us.